Wear the Swiss Military Squad Tide Watch with pride, designed with sophisticated chronograph dial detail, robust fibreglass case and flexible silicone strap for supreme comfort and style. Protected with a smart mineral crystal lens and 5ATM water resistance. Hanowa has been pushing the rugged aesthetic since 1963, when it was founded in Bienne, Switzerland by Hans Noll. In 1990, the brand made this look its signature style with the founding of Swiss Military by Hanowa – the aim to bring robust Swiss Sports watches that are able to function in extreme conditions at an affordable price. 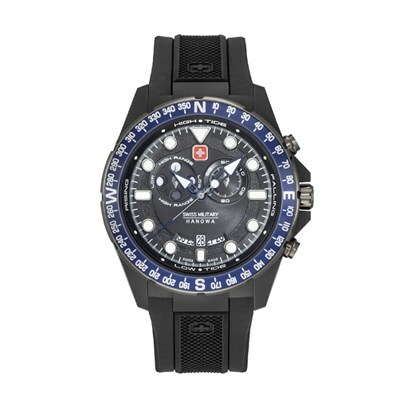 In 2015, the brand became one of only two brands that hold the official license of the Swiss Confederation – allowing the brand to display the Swiss Cross Logo on the face of the timepiece. This recognition is a significant milestone in the Swiss Military Hanowa timeline as it honours the high standards of quality upheld by the brand. Today, Swiss Military by Hanowa has a global presence in more than 70 countries worldwide.